Former President George H.W. Bush told CBS News that President Obama "is entitled to civil treatment and intellectual honesty when it comes to critics." Referring to the tone of national discourse he said, "I don't like it. The cables (TV) have a lot to do with it." In the radio interview, Mr. Bush said the volume of criticism aimed at him when he was president was not as "day in and day out." The Republican elder statesman said, "It's not just the right." He complained, "there are plenty of people on the left." While he said he does not believe in personal name-calling, he singled out MSNBC personalities Keith Olbermann and Rachel Maddow calling them "sick puppies." 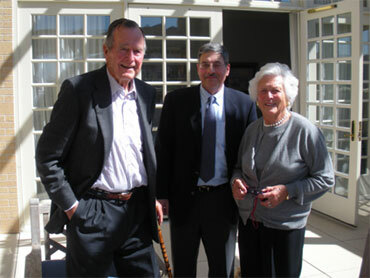 "The way they treat my son and anyone who's opposed to their point of view is just horrible," Mr. Bush said. "When our son was president they just hammered him mercilessly and I think obscenely a lot of the time and now it's moved to a new president," he added. With a chuckle, Mr. Bush said his son's critics "weren't singled out as much as they should have been." He said harsh criticism "should not be par for the course. To the degree it turns off one student or one person from serving that's bad." Mr. Bush said verbal attacks on Mr. Obama "sometimes crosses the lines of civility." He also said it crosses "party lines and ideological lines." Mr. Bush does not believe most of the attacks on Mr. Obama are racially motivated. He said, "You might find some racists out there but I don't think the attacks per se have to do that he's an African American." Hours before hosting Mr. Obama at a volunteerism event on the Texas A & M campus, Mr. Bush said, "People ought to be civil. I worry about yelling at people and this yelling mentality that seems to accompany presidents." Asked about recent verbal attacks on Mr. Obama, Mr. Bush said some of the national tone has worsened but he said he's reluctant to say the "ugliness" is new. Mr. Bush cited tough criticism of presidents throughout history. He also noted he has differences with the current president but he would not elaborate. Mr. Bush also said his own life is "very good, very private." Peter Maer is a CBS News White House correspondent. You can read more of his posts in Hotsheet here. Peter Maer is a CBS News White House Correspondent.